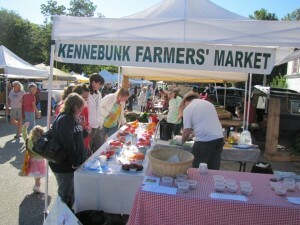 Kennebunk Farmers’ Market runs Saturdays 8:00am to 1:00pm at the Garden Street Lot • Rain or Shine! • May 4th through November 23rd, 2019. When you shop with us, you’re buying directly from the people who grew or raised or created that product for you. It’s a great way to support farms and keep your money circulating in the local economy. Celebrate the seasons The food you buy at the Kennebunk Farmers’ Market is seasonal. Everything is locally grown and it is exciting to see what each season produces. Reconnect with the cycles of nature; enjoy spring snap peas, summer sweet corn and crisp fall apples. Eat with the season and enjoy the variety! Support family farmers Family farmers are becoming increasingly rare. Large agribusiness farms and ranches are steadily taking over food production in the U.S. and small family farms have a hard time competing. Buying directly from farmers gives them a better return for their products and gives them a fighting chance in today’s economy. Variety Find a bountiful assortment of plants, flowers, vegetables and other goodies that you might not find at the grocery store. You can also find all sorts of yummy things aside from produce. You can also find local meats, dairy, jams, and baked goods (sooo hard to resist). It’s a great opportunity to try something new! Taste real flavors The fruits, vegetables and other goodies you buy at KFM are at the freshest and tastiest available. Our produce is allowed to ripen in the field not in a truck that is transporting it thousands of miles. Protect the environment Food in the U.S. travels an average of 1,500 miles to get to your table. Shipping uses large amounts of natural resources, especially fossil fuels, contributes to pollution and creates excess waste due to extra packaging. Walking to your local market decreases this extra waste. Know where your food comes from Meeting and talking to farmers is a great opportunity to learn more about how food is grown, where it is grown, when it is grown and why. You can also ask our vendors any questions you might have about their goods and how they are processed ‐ they will be happy to answer! Learn cooking tips, recipes and meal ideas Vendors at the KFM are often passionate cooks with plenty of free advice about how to cook the foods they are selling. Also, if you have a recipe you would like to share be sure to stop by and let us know; we would love to share it with others! Teach your children something new Promote healthy eating habits by shopping at the market with your kids. Helping them to understand where their food comes from will help them to understand the importance of being informed about their food choices. It might also help you to get them to eat more fruits and veggies! Connect with your community You never know who you’re going to run in to at the market. Shopping at KFM makes shopping a pleasure rather than a chore. The farmers’ market is a community gathering place ‐ a place to meet new friends, bring your children, or just enjoy a few minutes of fresh air! We’re open rain or shine Our vendors aren’t afraid of a little sprinkle! They will be there each and every weekend to serve you the best variety of goods they can. Let your kids puddle jump while you purchase your goods, and everyone goes home happy! Who wants to be cooped up inside anyway?